The Emery Round Lamp Table is a simple yet sleek piece of furniture. You can easily use it as a perch for your drinks and TV remotes, or as a spot for you to style some of your favourite ornamental pieces. The Emery Round Lamp Table combines modern finishes with a clean and defined shape, making it a perfect accompaniment to any home. 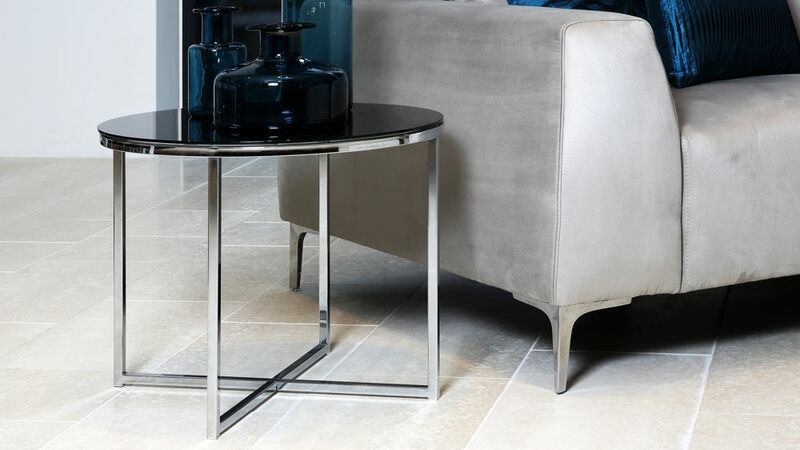 This circular modern side table has a classic clear glass top supported by a contrasting chrome frame. 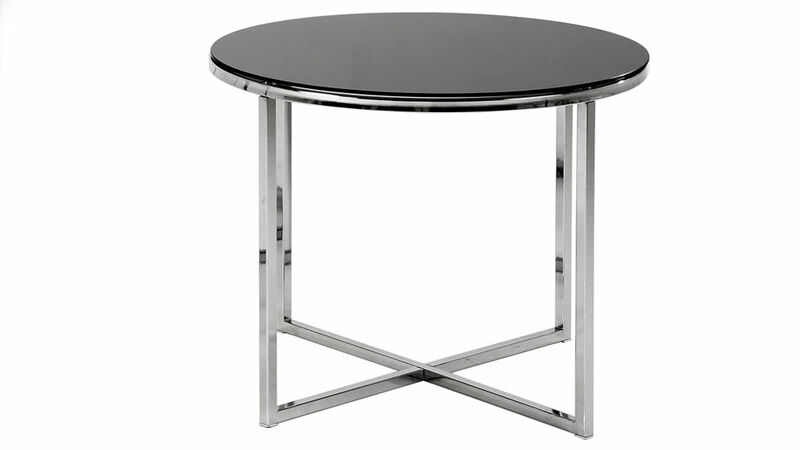 This combination of contemporary finishes really gives the Emery table its sleek and modern look. Clear pads sit between the glass table top and the chrome frame. This creates a light, almost weightless look while also protecting the two surfaces from rubbing together. The legs of the shiny chrome frame have a neat cross over design. This creates a stable base for this modern side table alongside being an interesting design feature. The Emery's simple shape and design means it is fit for a variety of different purposes such as a side table in your living room, or at either side of your bed as a spot for your bedside light. This makes the side table incredibly versatile. The Emery Round Lamp Table is perfect if you are after a simple but stylish table for your home. The Emery Square Lamp Table is a great alternative if you are after a slightly different shape, and if you're after a side table set, try the Emery Nest of Tables. 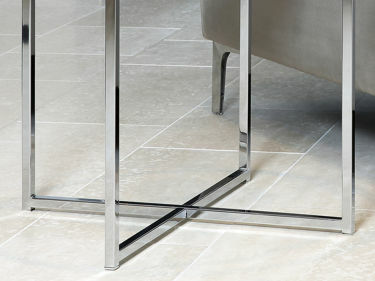 The cross frame base of the Emery lamp table is such a simple yet highly effective design feature. For starters, it’s such a contemporary look to mix and match shapes, such as the Emery’s rounded top with its more angular base, and this combination goes together seamlessly. The cross frame creates a really stable base for this lamp table, without making its shape look thick or bulky. To finish off the super modern look, the shiny chrome finish perfectly complements the glass top and sleek frame. Over all, the Emery Round Lamp Table is an understated yet very sleek piece for your home!